A Birmingham-based watchmaker has taken inspiration from a historic light bomber aircraft for his latest design, linking 80 years of British design and manufacturing. Built in Bristol, the Blenheim bomber was first flown by the Royal Air Force (RAF) on 10 March 1937 and was used extensively in the first two years of the Second World War. It is famous for being one of the first British aeroplanes to feature an all-metal stressed-skin construction, retractable landing gear, flaps, a powered gun turret and variable-pitch propellers. The Blenheim bomber was also converted to be used as one of the first effective British night fighter aircrafts. After a successful crowdfunding campaign, Dennis Chen has now created a watch which echoes the flight instruments found in the aircraft’s cockpit. Designed in Birmingham, the Chronomaster Pilot Watch has already received orders from as far afield as the USA, Canada, Hong Kong, Japan, Singapore, Germany and Denmark. The cockpit of the Blenheim bomber contained flight instruments on an easy-to-read panel with various functions that enabled the pilot to fly the aircraft. 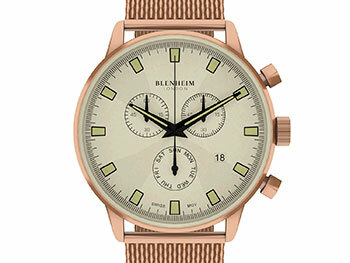 These dials inspired the creation of the military watch, which is powered by Swiss-made movements. 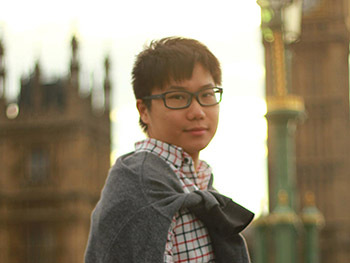 Dennis Chen, aged 28, was born and raised in China’s Hainan province before moving to the UK in August 2010, where he pursued a BA (Hons) Marketing degree at Birmingham City University. Dennis remained at the institution to study for an MA in Visual Communication (Graphic Design) before establishing Blenheim Watch in the city. Dennis was endorsed by Birmingham City University to remain in the UK following his education as part of the Government’s Tier 1 (Graduate Entrepreneur) visa programme. It allows international students to remain in the UK for up to two years to set-up and run a business upon graduation. More recently, Dennis has successfully applied for a Tier 1 (Entrepreneur) visa, which will allow him to continue his plans to grow and develop his business over the next three years. Dennis’ plans include opening an assembly studio in Birmingham, to cut down the time is takes to create his watches and also enhance the quality of the finished product. He is also looking at launching two more crowdfunding campaigns to create a diver’s watch with in-built smart technology. Alongside current stockists in Birmingham, London, Oxford, Bewdley and outlets in Denmark, Dennis is in talks to feature in UK department stores, such as John Lewis and Selfridges, this year. 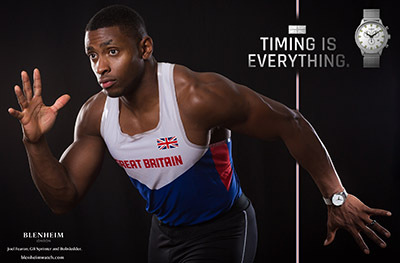 He’s already employed the marketing services of Birmingham-based agency Bareface to help push his ideas forward and in November 2016, English sprinter and bobsledder Joel Fearon – currently the third fastest UK 100m runner of all time – became Blenheim London’s Brand Ambassador. Dennis is a creative and passionate individual who has inspired other international students at Birmingham City University by highlighting that, on completing academic studies, you can remain in the UK to set-up and run an enterprise. “He has worked extremely hard to establish his business over the two years on the Tier 1 (Graduate Entrepreneur) visa programme and we are delighted for him in gaining the Tier 1 (Entrepreneur) visa to remain in the UK to continue to run his business successfully for another three years.